Heat pumps have become a popular home comfort solution in recent years for a variety of reasons. Their ability to both heat and cool a home, meaning year–round indoor temperatures are controlled with a single unit, is a big advantage. These revolutionary systems also eliminate the need for combustible fuel because heat pumps draw hidden heating or cooling energy from the air outside. The heat pump specialists at Millie’s Heating & Air Conditioning highly recommend Amana brand heat pumps for homes in the Arlington, Virginia area. Amana products have a history of keeping homeowners comfortable, dating back to 1934. You know you’re getting a quality product when you select one of their heat pumps. 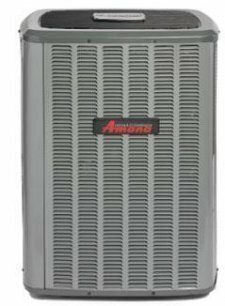 Amana offers a wide variety of heat pumps designed to meet the budgets and home heating needs of homes and families of all sizes. Call us today to talk to our experts. We’ll help you learn how a new Amana heat pump can save you money on your monthly energy bills and discuss which unit might be the year–round home comfort solution for you. We believe that this may be the best warranty in the air conditioning business. The compressor in your new ASZC18 heat pump system is covered by a Lifetime Limited Warranty. * If the compressor ever fails, a new heat pump unit will be provided to the original purchaser of the central heat pump system as long as they live in the same single–family residence. All remaining functional parts are covered by a 10–Year Parts Limited Warranty*. For a full description of all warranties applicable to this product, please click on the consumer brochure or product warranty links above. Year–round exceptional heating and cooling energy–efficiency is a primary benefit delivered by this heat pump system. It provides improved temperature and humidity control, and it uses R–410A chlorine free refrigerant. All features are what we believe to be among the best in the heating and cooling industry.